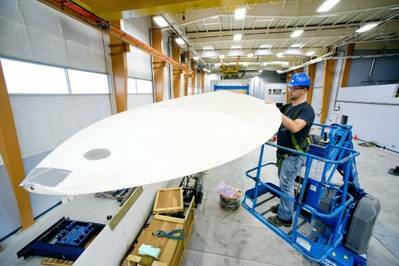 Universtiy of Maine's Advanced Structures & Composites Center granted up to $4 million to fund offshore windmill project. Habib Dagher, the director of the Advanced Structures and Composites Center, is busy planning the first phase of a “potential $93.2 million deepwater offshore wind demonstration project by the U.S. Department of Energy. The DOE held a competition to screen proposals for clean energy that would jumpstart wind farms in the United States. Seventy competitors submitted proposals for a chance to receive funding for their development of offshore wind energy. The UMaine Composites Center team won the first phase of funding, which will grant the Composite Center up to $4 million to complete the engineering and design of the project. After the first phase the DOE will select up to three projects to receive follow-up funding to further develop the project to construct a final product. Dagher has high hopes and aims to have two floating offshore wind turbines off of Monhegan Island by 2017. Dagher suggests that if UMaine is granted the next round of funding it will create jobs in Maine. “It would make Maine a hub for offshore wind energy,” Dagher said, in regard to the potential for people and businesses around the world to come to Maine for these resources.